The six Jersey calves that are still getting milk had eaten up all the grass around their pen in the poleshed. 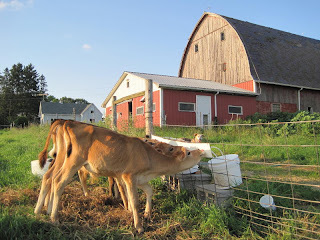 We packed up their milk bar and moved them down to a lush pasture near the dairy barn. They started out by kicking up their heels and taking a few laps to check out their new digs before settling in. I was happy to see how well they came through Wednesday's downpour. They are already sturdy fellows, ready to join their mates who've already been weaned. 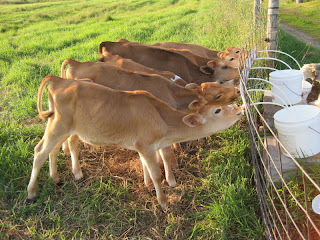 In the meantime they are enjoying their transitional pasture and their last days of milk.